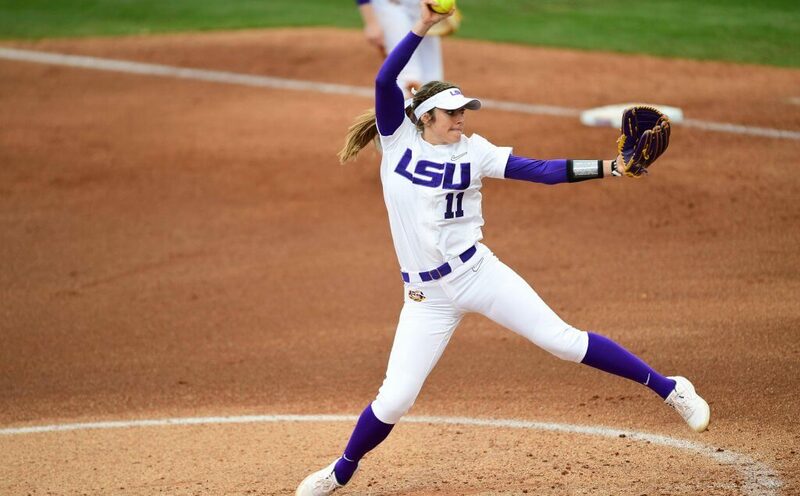 Shelby Wickersham threw a no-hitter in her LSU debut Friday, a five inning 9-0 win over Iowa. Photo: LSU Softball. Shelby Wickersham had a hugely successful softball career prior to officially taking the field with LSU officially on Friday as she was a 1st Team Extra Inning Softball All-American pitcher as a senior at Mt. 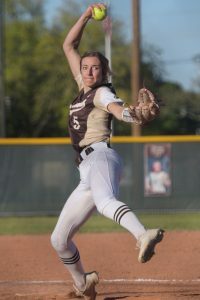 Carmel Academy (Metairie, Louisiana) High in 2018 and was ranked in the Top 10 of the 2018 Extra Elite 100 playing for the Marucci Patritos so it wasn’t a surprise she won her first outing, a five-inning 9-0 walk-off win over Iowa. What was impressive, however, was she didn’t give up a hit in her debut for the Tigers and became the sixth freshman in LSU history to pitch a no-hitter. Wickersham faced 19 batters and gave up two walks while striking out two in the first of two games Friday at LSU as part of the Tiger Classic. In the second game of the day, LSU also won in five innings, shutting out Tulsa 11-0 to run its record to 3-0 two days into the season. Wickersham, who had taken pitching lessons from Torina while still in high school, was complimentary towards her teammates in the win. The pitcher in May, 2018 in the circle for Mt. Carmel Academy. She would go on to earn 1st Team Extra Inning Softball All-American honors as a senior. It wasn’t the first time she had thrown a no-hitter or even a perfect game for that matter: in her prep career, Wickersham had 10 perfect games and as a high school senior, the 5-foot-10 pitcher threw a perfect game, two no-hitters, three on-hitters and five two-hitters to earn All-American honors. Last spring, she also had 232 strikeouts in 136 innings and compiled a 1.08 ERA to lead her team to the state semi-finals. As a junior, the talented athlete won state titles in volleyball and softball at the Class 5A level and over the last two years at Mt. Carmel Academy, an all-girls Catholic school of approximately 1,200, she went 35-8 with a 0.97 ERA and averaged 1.84 K’s per inning. Although recruited by other top programs nationally and being ranked in the Top 10 of her class by Extra Inning Softball, it was all but assured she would stay in Baton Rouge thanks to her LSU ties as her father Jeff was a quarterback at the SEC school before playing for the Miami Dolphins in 1985. The two-sports star also shined in the class room compiling a 4.6 GPA and was her class Valedictorian. Wickersham’s no-hitter was one of three on the day according to NCAA.com with Kandra Lamba striking out five Incarnate Word batters in a 11-0 five inning win and Faith Sims of Jacksonville State going seven innings to keep Army without a hit in a 6-0 victory.